Most young scientists don’t get the opportunity to do field work until college. The UNC Environmental Resources summer program is working to change that. 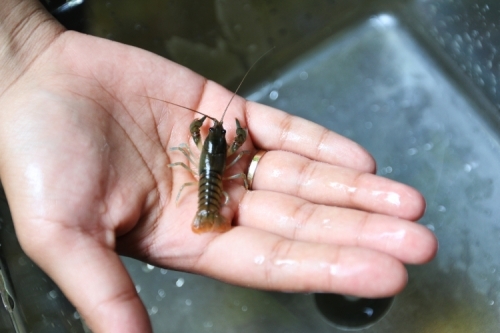 A student discovers a crayfish while taking water samples at the New Hope Creek in Durham. The IDEA (Increasing Diversity and Enhacing Academia) High School Program allows local high school students to get hands-on experience conducting field work. It is a sticky, humid Tuesday morning in July. While many teenagers are just starting to roll out of bed, the high school students I’m with are unloading equipment from a van as they prepare to do some water testing at New Hope Creek in Durham. They are planning to conduct tests on the chemical and biological composition of the water, as well as examine how the water shapes rock formations. This is a typical morning for participants of the Increasing Diversity and Enhancing Academia (IDEA) High School Program, a portion of UNC’s Environmental Resource Program, for local high school students interested in the geosciences. During the week-long institute, students attend classes, conduct experiments, meet seasoned scientists, and take daily field trips. They also attend three half-day Saturday academies during the school year. This year’s institute is focused primarily on the environmental challenges in Ellerbe Creek, one of Durham’s urban watersheds. Lara Summers, a rising senior at Northwood High School, says that she first heard about the program from her AVID college preparatory teacher. “I am a bit of a science nerd, and I love the outdoors,” Summers says. “I felt that the program would be a fun and productive way to spend part of my summer break.” Summers, who hopes to pursue a science major in college, says that she loves the outdoor hands-on activities that the students do in the program. Many students are never exposed to geosciences, says program leader Kathleen Gray. According to research from the National Science Foundation, specific groups that are underrepresented in the sciences as a whole are even less well represented in geosciences. Gray says that the IDEA program is a great way to combat both of these issues while engaging passionate students each year. Working with a network of science teachers and science curriculum specialists, the IDEA program reaches out to students across the Triangle area. “The main goals of the program are to expose all students to geosciences in hopes that they will pursue graduate degrees and careers in the area, and to encourage underrepresented groups, including African Americans, Native Americans, Hispanics, and those with physical disabilities, to enter the science field,” Gray says. In addition to the high school program, the grant also funds undergraduate interns that work during the school year and the summer. Since the start of the program, 85 high school students and 23 UNC undergraduates have participated. According to Gray, several of the undergrad interns have gone on to lead successful lives working in the geosciences. One student, after considering private sector offers ad graduate school, opted for graduate study in geographic information systems and has gone on to be a GIS analyst in the private sector. Aside from the hands-on field work, the students also have the opportunity to participate in some recreational outdoor activities while in the program. One participant, Makayla Butler, says that she is most excited for the canoe trip that the students will take on the last day of the program. The Increasing Diversity and Enhancing Academia High School program is funded by a grant from the National Science Foundation. The program is run by UNC Chapel Hill’s Environmental Resource Program, a portion of the Institute for the Environment. The program is free of cost and participants receive a $500 stipend upon completion of the summer institute and the school year Saturday Academies. This year, the program partnered with North Carolina Central University and Ellerbee Creek Watershed Association. Kathleen Gray is the Associate Director for Outreach and Public Service at UNC’s Institute for the Environment. Chris McGinn is an Assistant Professor in North Carolina Central University’s Department of Environmental, Earth and Geospatial Sciences.